A network that transmits alternating currents of desired frequencies while substantially attenuating all other frequencies. Also known as frequency-selective device. an electric device that separates from the spectrum of electric oscillations supplied to its input those components that lie in some given frequency band. The components separated are the only ones that are fed through to the filter output; all other components are attenuated. Electric filters are used in multichannel communication systems, radio equipment, and automation and remote control devices, as well as in electronic measurement technology. They are suitable for any application where electric signals are transmitted in the presence of other (interfering) signals or noise differing from the transmitted signal in frequency composition. Electric filters are also used in current rectifiers to attenuate the pulsation of rectified current. The frequency band that includes the passed components is called the passband, and the band that includes the attenuated components is called the stop band. The filtering properties of an electric filter are quantitatively described by the magnitude of attenuation contributed by the filter relative to the components of the spectrum of electric oscillations. The greater difference in attenuation between the stop band and the passband, the higher the filtering capacity. Electric filters may be classified according to the shape of the curve describing attenuation versus frequency. Low-pass filters transmit oscillations having frequencies no higher than some cutoff frequency fu and attenuate oscillations with frequencies higher than fu. Conversely, high-pass filters transmit oscillations with frequencies higher than some frequency f1, and attenuate oscillations below this limit. 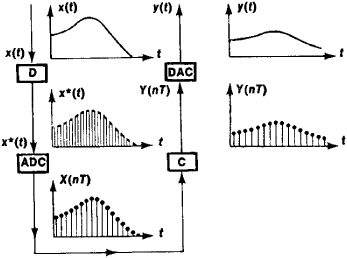 Band-pass filters transmit oscillations only in a finite frequency interval, from fu to f1. Band-elimination, or rejection filters, exhibit frequency characteristics that are the reverse of those of band-pass filters. 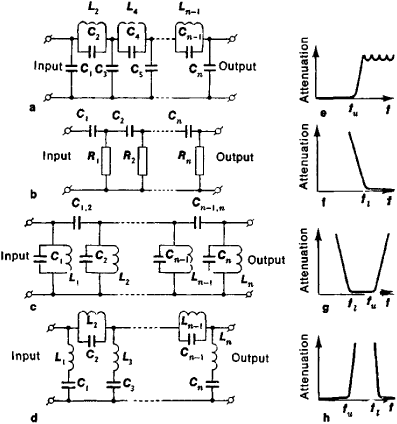 hundreds of kHz the most widely used designs have passive or active RC filters (Figure l,b), which incorporates resistors and capacitors (active filters also contain an amplifier). The operating principle of LC and RC filters is based on the dependence of capacitive and inductive reactance on the frequency of alternating current. Electrothermal filters are used to filter signals at frequencies of fractions of Hz. They are built in the form of rods that incorporate a heat source and a thermoelectric converter. The addition of a feedback-type amplifier makes it possible to use such filters as high-pass and band-pass filters. Electromechanical filters may incorporate disk, cylinder, plate, dumbbell, or tuning-fork resonators. Their operation is based on the principle of mechanical resonance, and the application range is from several kHz to 1 MHz. Piezoelectric band-pass filters and band-elimination filters exhibit high filtering capacities. They are made from such materials as piezoelectric quartz or piezoelectric ceramics. Some designs use discrete components, such as quartz resonators combined with inductance coils and capacitors; in monolithic designs the coupling between resonators is achieved by acoustic waves—either space waves (for filters used in the range from several MHz to tens of MHz) or surface waves (for the range from several MHz to 1–2 GHz). Digital filters constitute a special group of electric filters (Figure 2). They are frequently constructed from integrated circuits. Electric filters used in microwave technology incorporate sections of transmission lines (coaxial cables, strip lines, or metal wave guides) and are essentially distributed oscillatory systems. For the frequency range from 100 MHz to 10 GHz, serviceable filters can be designed as comb, step, and other types of filters made from strip resonators. Waveguide filters are often used in the range from several GHz to tens of GHz. They consist of waveguide sections with a raised cutoff (critical) frequency (high-pass waveguide filters) or sections containing resonant diaphragms or cavity resonators (band-pass waveguide filters). Beletskii, A. F. Teoreticheskie osnovy elektroprovodnoi sviazi, part 3. Moscow, 1959. Beletskii, A. F. Osnovy teorii lineinykh elektricheskikh tsepei. Moscow, 1967. Znamenskii, A. E., and I. N. Tepliuk. Aktivnye RC-fil’try. Moscow, 1970. Alekseev, L. V., A. E. Znamenskii, and E. D. Lotkova. Elektricheskie fil’try metrovogo i detsimetrovogo diapazonov. Moscow, 1976. If necessary, even higher removal rates can be achieved with an optional Monforts electric filter. In the refining shop a new bridge grabbing crane, a heat exchanger and an electric filter was installed. Reverse purge and electric filter shakers are also available. There was even some sort of electric filter creating bubbles. If a household's uses two purification methods, we consider the one that is the most effective, where effectiveness follows the order: electric filter (most effective), ordinary filter, use of chlorine tablets and boiling (least effective). We need a bigger thing with an electric filter and a vast price tag. The stack gas, to a great extent freed of fuel, passes to electric filter for after-cleaning and is emitted through the stack. Catalysts will be delivered subsequently installed on the side of the raw flue gas for electric filter. Contract award: Oulu energy toppila 2 power plant, the electric filter renovation or a new electric filter. Boiler plant equipped with flue gas scrubbing and condensing installations, electric filter, fuel storage and handling equipment, including motor-truck scales, disc screen and crusher, kaksihorminen chimney 40 m and 99 m3 docked to light the oil tank.